We find Stalagmite once again in the naughty corner. I swear there is just something wrong with me when knitting this pattern. First sock went in the naughty corner after I messed up the cabling in the leg of the sock (I later ripped back three rounds and fixed it). Now it’s sock #2 that’s causing me grief. Just compare the top bit of the photo with the lower half. You’ll see. I was watching the latest ep of True Blood and apparently not paying enough attention to the sock. I haven’t ripped back yet, but I will tomorrow. When I’m done being mad at it. In the meantime, I’ve cast on Dawn Gnot by Heather Zoppetti with some Woolhunter that Lucy gave me as a birthday present. So far I’ve done the toe and one pattern repeat. I only work on it while at work (as in waiting for work to start or during my lunch break) so it’s not seeing as much action as Stalagmite (a lot of good that’s done!). 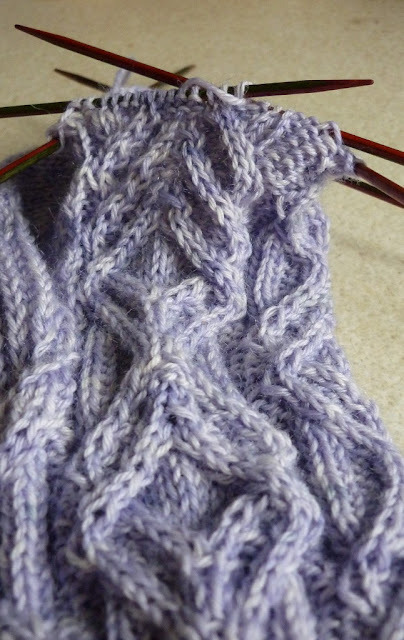 I’ve also caved into a very strong urge and cast on Cadence by Jordana Paige (a Knitty pattern). I’m using the green yarn I bought this summer while in Finland (at 3 100g skeins for 5€, there was no way I’d say no to that deal). I’m using 5mm circs and so far I’ve done about 10 rounds. I really like the pattern so far. Turns out, I like quite a few of Jordana’s patterns. I’ve already knit Isabella (summer top), an apron and I’ve got Amused (a sweater) queued up. And I’m considering Starsky, but I don’t really knit jackets so who knows if I’ll ever get around to that one.